Item is a photograph of the University of the West Indies Registrar, Carl E. Jackman, visiting Dalhousie on September 26, 1975. Mr. Jackman was touring Atlantic universities in the fall of 1975. Photograph shows (from left to right) Dr. A.J. 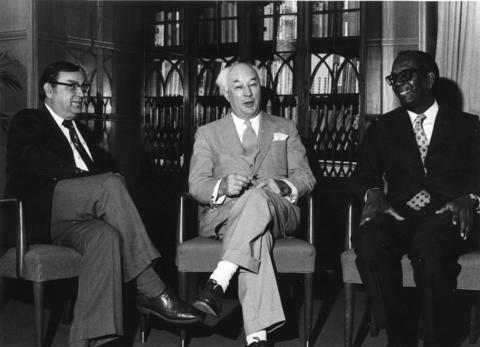 Tingley, University Registrar; President Henry Hicks; and Carl E. Jackman, Registrar at the University of the West Indies. Photograph was published in University News, October 17, 1975. Item is accompanied by an index card with information about the photograph.